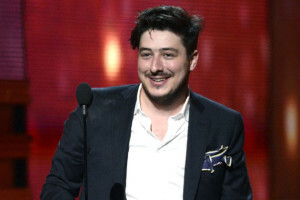 Mumford and Sons was already a very popular band, but in light of its Album of the Year Grammy win this past Sunday, it would appear that not only do the masses appreciate its formulaic, arena-sized bluegrass/ indie rock, but that the foursome, led by Marcus Mumford (pictured here on the left. That’s not Brendan Frasier), has also achieved industry-wide validation. It’s a strange thing, witnessing a British band appropriate and popularize such an inherently American sound to the extent that, to many, they could have ostensibly invented the banjo. But the weirdest thing about this band is not its sound (predictable and redundant), nor is it its fashion sense (moustaches, vests, sleeves rolled up, hairy forearms). Rather, it is Mumford’s enormous popularity with Jews. Now before I elaborate, I must admit that I cannot substantiate this assertion with cold hard data. I can only tell you that the other night at the Barclays Center when I saw Mumford and his buddies (no, Mom, they’re not actually his sons), I saw a lot of yarmulkas. Enough yarmulkas to recruit for both a maariv minyan and a few breakaways. Why would so many Orthodox Jews be in attendance of a show that’s not Matisyahu? Why is it that I personally knew nearly a dozen Upper West Siders in attendance who, of course, had dined at the trendy kosher Brooklyn restaurant Pardes beforehand? My friend sitting next to me had the same question. I posited that it must have been the location – Brooklyn’s Barclays Center, with its proximity to Borough Park and Flatbush, coupled with the fact that the arena has a delicious kosher food stand. He countered that he had been to a few shows there already, including Jay-Z and Bob Dylan, and was certain that the Semitic count had not been this high. Remember, this is in defense of them. And he’s right. They all do. In fact, almost every song in its Barclays’ setlist employed this tactic, which also made me wonder whether they were playing the same song over and over again or not. Breihan doesn’t mention, however, that Marcus Mumford, who is a full blown bluegrass revivalist, admittedly stumbled onto the genre he’s popularizing via the O’ Brother Where Are Thou? soundtrack. You know the one. George Clooney had a hit song on it. Now, it’s not nice of me to employ that fact as a right hook to the credibility of the band. For all I know, Marcus Mumford, Ben Lovett, Winston Marshall, and Ted Dwane have spent the last decade immersed in obscure Americana folk records. They may have become so well versed in our nation’s oldest cultural traditions that their recordings could fool even Harry Smith himself. But, ultimately, they’re still four kids from West London who are co-opting a sound to which they have no inherent link. Their sound is one of appropriation, like they’d seen a vintage painting in a thrift shop and hung it on a wall, out of context and without resonance. Now, take a leap with me. A big leap. This leap…it’s kind of huge. For many of us, as Jews connected to this country by as little as a generation or two, we can understand the notion of taking on a new identity, whether or not that identity is really ours, or simply borrowed. In a sense, over the last few generations we, as a people, have assimilated, not necessarily in a religious sense (that, too), but by fitting very naturally into the make-up of this nation. Maybe that’s why when we, as the Chosen people, watch a band like Mumford & Sons as it succeeds in taking on a sound that was never intended to be theirs, we can relate. Call it appropriation, as I did before, or call it dressing up, but however you label it, it’s a knowing that no matter how hard we try to do something–and we always do it well–it’s still not quite ours. Sure, there will always be someone to criticize that–in Mumford’s case, it’s the critics. In ours, it’s, um, everyone…? And sure, it’s probable that I’m over-thinking this (yet this is what happens in my head most of the time) but as Marcus Mumford won a Grammy for piggybacking on a legacy, I wonder – is it really so weird for a bunch of British guys to play bluegrass? After all, look at what we’ve accomplished. We’ve probably won like, dozens of Grammys. On the other hand, my wife posits that the affinity stems from the fact that Mumford is catchy and they kind of dress like old European Jews. She’s probably right. I would say you are over-thinking this. Their songs have more substance than they are given credit for, and just because a musical style originated in a certain location should not mean that those adopting the genre from other areas should be criticized for doing so. Music, as a uniting factor, should not be set aside as exclusive to those who labored through it’s origination. The Mumf combine Bluegrass with their own London style and it makes them unique as well as relatable. In terms of it being popular with the Tribe, I do not think it is anything special. As a ModOx Jew, what draws me to them is simply their sound and the emotion that they infuse in the music. You mentioned the climaxes that litter their most popular songs, and it definitely is a factor. The have heart and few bands do. Even if it’s fake, it’s real to me. I could care less about their intentions. Since I live in the Midwest, fellow MOTs here haven’t gotten the memo yet. They are still heavily into OAR and Guster. I’m an old though, so I don’t know who any ofthese people are, the aforementioned OAR and Guster included. All I know about Mumford and Sons is that they look like they should be digging subway tunnels in Victorian England. I’m more of a Clash and Ramones gal. More Jews should be into them. The Ramones were half Jewish and The Clash were a little over a quarter. I know I’m making no sense. It’s the wine. I am surprised you have not addressed the Christian references in their lyrics. Although M & S deny it, many consider them a Christian band. As a Jew, and a huge fan, I had hoped you could shed light on this aspect of the attraction to jewish fans. Christian band from what I’ve heard. No wonder Jews like them. Right or wrong I enjoyed the intelligent verbiage calisthenics that it took to pen this, touché sir Arye. I actually wasn’t aware of the Christian elements. But then again, in retrospect, I guess that could make sense. I’ll have to look into this. And thanks, Yos. Very kind of you. Much obliged. Having spent too long in neo-Pentecostal churches, the first time I heard “I Will Wait”, I thought “That sounds like a song from my ex-church, but with banjos.” While people outside the new trend of megachurch rock bands may not recognize it, “worship concerts” are a big deal, and an increasingly possible way to make a living. Many Christian rockers have dropped faux angst for straight up love songs to Jesus, sung with all sincerity (and parodied mercilessly in a South Park episode). Then again, lots of Christian kids love Matisyahu. He’s positive, clean, inspiring, and loves G-d. Ever since the Jesus Movement in the ’70s, a good subset of evangelical and Pentecostal Protestants loves to appropriate Jewish stuff.